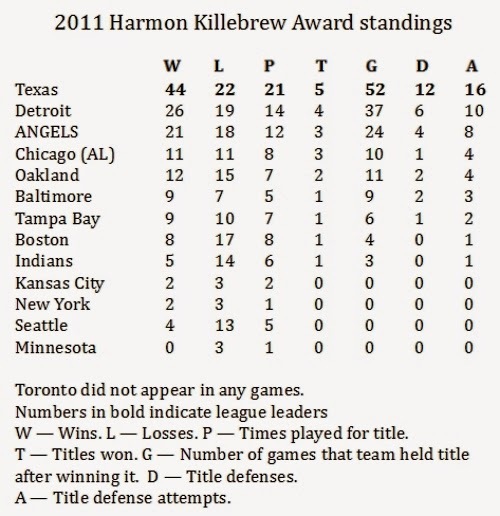 Here are the final results and standings in 2011 for the Harmon Killebrew Award, which distinguishes the team holding the American League traveling prize. For winning the American League pennant in 2010, the Texas Rangers were granted the Killebrew as a starting point. But the Rangers made it much more than a starting point. They made the Killebrew almost their own private possession, dominating the competition all year. 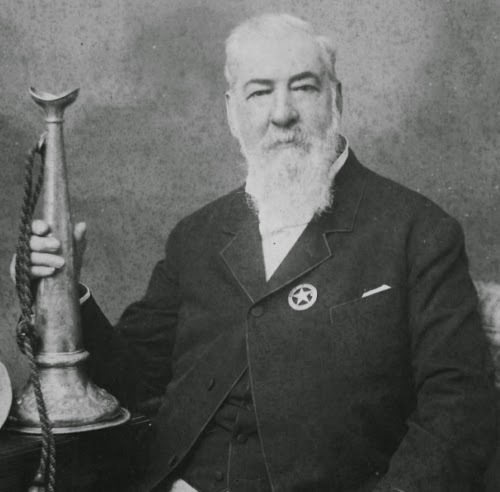 The Rangers began the year with three title defenses, then won four more titles to hold the prize for 52 days. And, when the Killebrew got away from them, they took it back in the end with their American League Championship Series victory over the Detroit Tigers. With 12 title defenses in 16 tries, the Rangers were all but unstoppable. The Tigers and Angels both were strong with the Killebrew in 2011, but, if you put them both together, they would have been barely as accomplished as the Rangers. Texas 3, Boston 0 — April 1-3 at Arlington. Texas 3, Seattle 0 — April 4-6 at Arlington. Detroit 2, Texas 1 — April 11-13 at Detroit. Oakland 2, Detroit 2 — April 14-17 at Oakland. Oakland 15-14. Oakland 1, Boston 1 — April 19-20 at Oakland. Oakland 8-5. Oakland 2, Seattle 2 — April 21-24 at Seattle. Oakland 14-7. ANGELS 2, Oakland 1 — April 25-27 at Anaheim. ANGELS 2, Tampa Bay 1 — April 29-May 1 at St. Petersburg. ANGELS 2, Boston 2 — May 2-5, at Boston. ANGELS 24-19 (Won Game 4, 11-0). ANGELS 2, Indians 1 — May 6-8 at Anaheim. Chicago (AL) 2, ANGELS 1 — May 9-11 at Anaheim. Chicago (AL) 2, Oakland 1 — May 13-15 at Oakland. Texas 1, Chicago (AL) 1 — May 16-17 at Chicago. Texas 7-4. Texas 1, Kansas City 1 — May 18-19 at Kansas City. Runs 6-6. Texas win on Ks, 14-12. Texas 2, Chicago (AL) 1 — May 23-25 at Chicago. Texas 2, Kansas City 1 — May 27-29 at Arlington. Texas 2, Tampa Bay 1 — May 30-June 1 at St. Petersburg. Detroit 2, Texas 1 — June 6-8 at Arlington. Detroit 2, Seattle 2 — June 9-12 at Detroit. Detroit 17-12. Detroit 1, Tampa Bay 0 — June 13 at Detroit. 2-1, ten innings, makeup of May 25 PPD. Detroit 2, Indians 1 — June 14-16 at Detroit. ANGELS 2, Detroit 1 — July 4-6 at Anaheim. ANGELS 4, Seattle 0 — July 7-10 at Anaheim. Oakland 3, ANGELS 1 — July 15-17 at Oakland. Detroit 1, Oakland 1 — July 19-20 at Detroit. Detroit 13-10. Detroit 2, Minnesota 1 — July 22-24 at Minneapolis. Chicago (AL) 2, Detroit 1 — July 25-27 at Chicago. Boston 2, Chicago (AL) 1 — July 29-31 at Chicago. Indians 2, Boston 2 — August 1-4 at Boston. Indians 21-16. Texas 2, Indians 1 — August 5-7 at Arlington. Texas 2, Seattle 1 — August 8-10 at Arlington. Texas 3, Oakland 0 — August 12-14 at Oakland. Texas 3, ANGELS 1 — August 15-18 at Anaheim. Chicago (AL) 2, Texas 1 — August 19-21 at Chicago. ANGELS 2, Chicago (AL) 0 — August 23-24 at Anaheim. Texas 2, ANGELS 1 — August 26-28 at Arlington. Texas 2, Tampa Bay 1 — August 30-September 1 at Arlington. Texas 2, Boston 1 — September 2-4 at Boston. Tampa Bay 2, Texas 1 — September 5-7 at Tampa Bay. Tampa Bay 3, Boston 0 — September 8-10 at Tampa Bay. Baltimore 2, Tampa Bay 1 — September 12-14 at Baltimore. Baltimore 2, ANGELS 1 — September 16-18 at Baltimore. Baltimore 3, Boston 1 — September 19-21 at Boston. Detroit 2, Baltimore 1 — September 23-25 at Detroit. Detroit 3, Cleveland 0 — September 26-28 at Detroit. Detroit 3, New York 2 — September 30-Oct. 6 at New York and Detroit. Texas 4, Detroit 2 — October 8-15 at Texas and Detroit.